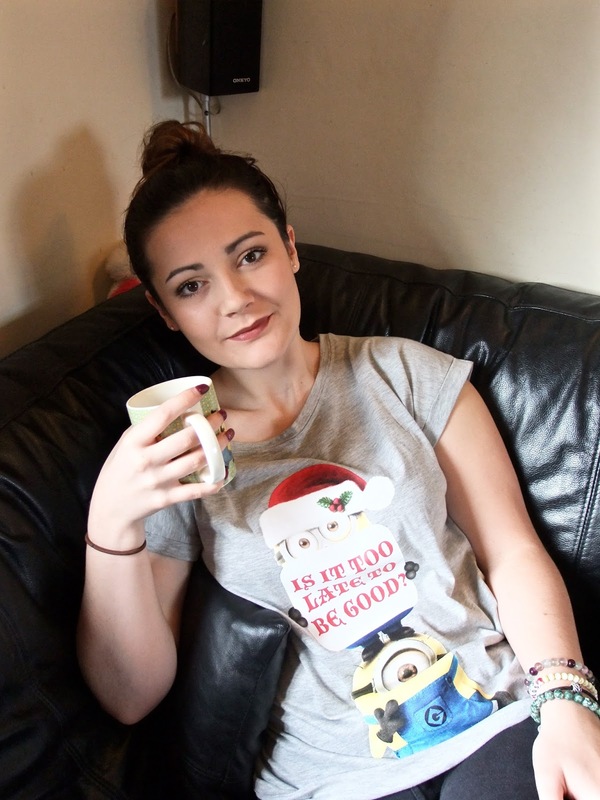 I was recently contacted by George at Asda asking if i would do a Christmas related post. They have got in touch with a few bloggers asking if they would choose a dress from their website and some other pieces to create a look into what my outfit will be on Christmas Day. With this, George will be launching their brand new blog, and in the 25 day leading up to Christmas, they want to share a different bloggers style with their customers in an Advent calendar style. So carry on reading if you want to see what i'll be doing and what i'll be wearing come Christmas Day! So, Christmas day for me will start by me getting up at about 10am or earlier depending if my brother wakes me earlier. Every Christmas since i can remember, me and my brother Scott get a stocking in our room filled with some cute little presents. It's been a tradition that we wake the other one up and open our stockings together. I love that we do this because it's nice to spend half an hour together chatting and talking about the antics of Christmas Eve! 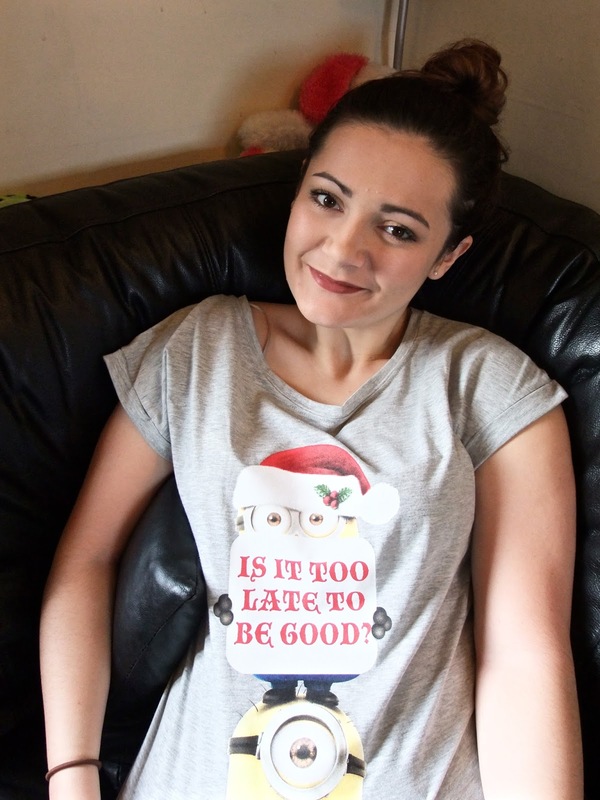 I will probably stay in my pjs now from the time i've got up till about 90 mins before Christmas dinner. 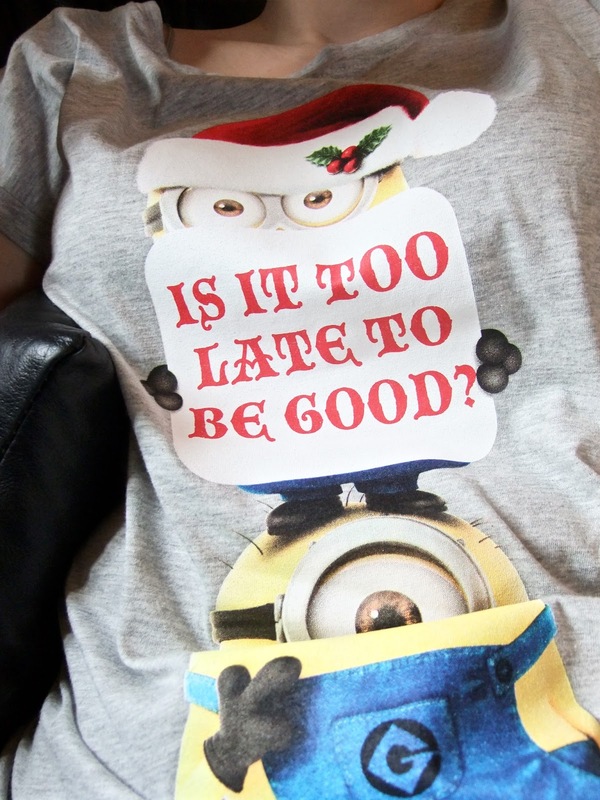 I love minions for anyone who doesn't know, and this gorgeous Minion top from George is only £7! Once my brother and I have opened our stockings, we come downstairs and get ourselves a drink. Mine is usually a green tea, we then sit in the front room next to our Christmas tree and start opening all the presents. We also make sure we've got the Christmas music channel on so we can listen to some festive songs while opening the presents. I'm always the one who grabs the presents from under the tree and passes them to the right person, and we all have specific places which we sit in. After we've opened our presents, we usually have a play around with whatever we've been lucky enough to receive from Santa and then my parents go off and start cooking the dinner while i go and get ready. 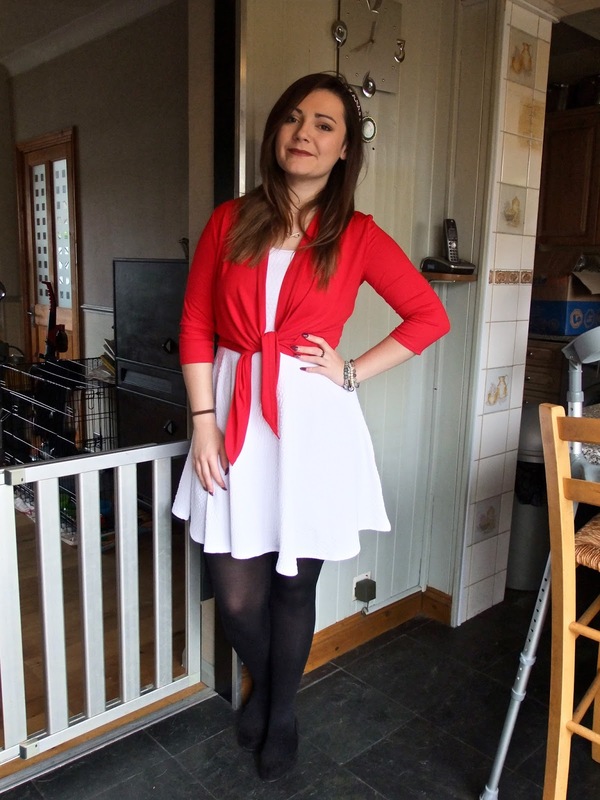 London Chic White Skater Dress(*) Red Crepe Bolero Cardigan(*) Black 100 Denier Thermal Tights(*) Primark Black Flat Shoes. New Look Silver Detail Headband. I love getting all dressed up on Christmas day. My brother and my parents like to wear lounge around clothes, but i always get my make-up on and wear something really nice. 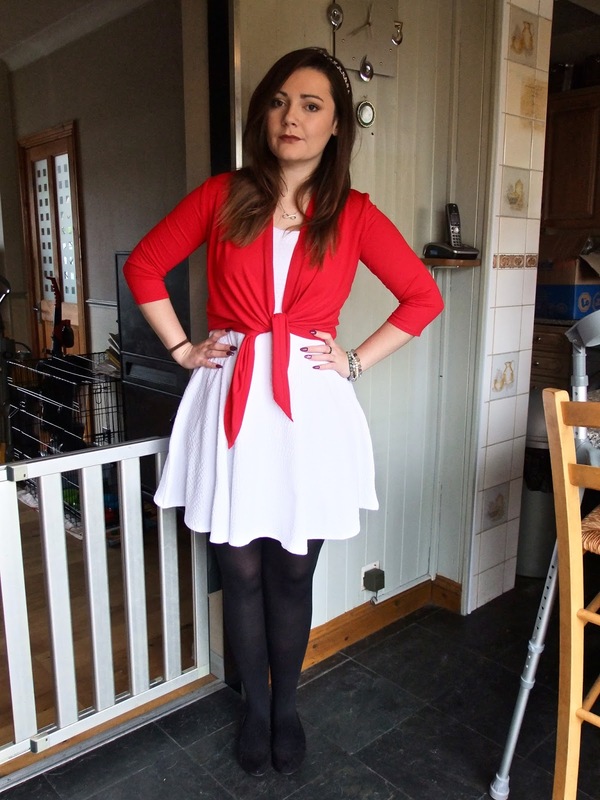 This year it's going to be this gorgeous white skater dress from one of the brands at George and this red bolero. I think this makes quite a nice Christmassy outfit, as the red mixes in with the theme of Christmas, i'm wearing tights as it's obviously going to be freezing, yet probably no snow. I've also got on a cute headband from New Look just for a bit of bling. These tights are also from George and are the most comfortable tights i've ever owned, the come up really high just how i like it too. After i've finished getting ready and obviously taken some Christmas style outfit photos to post on the blog i'll help lay the dinner table(sometimes lol). By around 2/3o'clock Christmas dinner will be on the table. We usually have three courses but i only have the one. For starters there is either a prawn cocktail or some fruit. For the main there is a full roast dinner with all the trimmings, and then for dessert if people aren't already too full by then, there is Christmas pudding. I'm not the biggest fan of Christmas pudding so i usually pass on it, whereas my dad loves it. I love sitting at the table engaging in festive conversation, again with the music channel on listening to some festive songs! I may even treat myself to a glass of wine or prosecco too! After we've eaten and the table has been cleared, everyone usually goes off and does their own thing for a while. Sometimes we play a board game as a family and i'm really eager that we do that this year as i think it's a great family bonding time. I've also suggested that this year we play a bit of beer pong as it's just such a fun game! As the evening arrives we usually sit in the front room watching tv Christmas specials such as Eastenders, Hollyoaks and Doctor Who. The day is usually a lot of fun, exhausting for my parents though. I'm really excited for Christmas this year and have already done 90% of my Christmas shopping which i'm quite impressed with! I hope you all have an amazing Christmas this year, surrounded by lots of family and friends.